HAVANA — Thursday will mark the end of an era for Cuba. That's the day Raúl Castro, 86, steps down as Cuba's president, the first time in more than 40 years the country won't be led by a Castro brother. As founders of Cuba's 1959 communist revolution, Fidel and Raúl Castro directly shaped the country's history and its role in power dynamics across the globe. Now all eyes are on Miguel Díaz-Canel — seen by many as Raúl’s hand-picked successor as the nation's next leader. “Following Cuba’s political system, it’s only logical that Díaz-Canel become president after serving as first vice president for the past five years without any issues,” said Arturo Lopez-Levy, a former analyst with the Cuban Interior Ministry who is now a lecturer at the University of Texas, Rio Grande Valley. Díaz-Canel, 57, has a long history in Cuba politics. Before his current role, he was the minister of higher education. Díaz-Canel headed the Communist Party of Cuba in Villa Clara province from 1994 to 2003, at a time when the country was suffering from a severe economic crisis after the fall of the Soviet Union, which had heavily subsidized the island nation. Some have speculated on Díaz-Canel’s moderate views but, in the past year, he has taken an increasingly hard line, emphasizing the continuation of Cuba’s single-party political system and centrally planned economy. The upcoming presidential transition comes at a time when Cubans are feeling frustrated over the slow pace of market-style reforms initiated by Raúl Castro in 2011 and as relations with the U.S. have cooled significantly under the Trump administration. Those two issues will likely be major challenges for Díaz-Canel once he takes office. Facing an economic recession and an average salary of around $30 a month, Cubans will be looking for a better standard of living from their new leaders. “Whoever takes over in April will have to get Cuba out of this great economic crisis and elevate the quality of life for Cubans,” said Miriam Leiva, a dissident and former senior Cuban diplomat, who was expelled from the Ministry of Foreign Affairs in 1992. Díaz-Canel will also face the challenge of navigating a complicated relationship with the U.S. In early March, the Trump administration announced it would permanently reduce the staff at the U.S. Embassy in Havana by 60 percent. The decision came after the U.S. evacuated nonessential personnel in October after embassy staff members were sickened in a series of unexplained health incidents. As a result, the State Department issued a warning, recommending Americans “reconsider” traveling to the island. Cuba denied any role and has cooperated with an FBI investigation. The diplomatic incident came on the heels of President Donald Trump's reversal of Obama-era policy changes regarding Cuba. Trump renewed travel restrictions, and Americans now must visit as part of organized tour groups run by U.S. companies. As the U.S. has hardened its policy, Cuba has responded with tough talk. Who is the man poised to be Cuba's next president? During the past few weeks, Cuban state-run media has increased the amount of news centered around Díaz-Canel, a possible sign of what is to come. The National Assembly is expected to ratify Díaz-Canel as the next president on Thursday — a day before he turns 58 — and such a move would represent a generational shift from the Castros. As is generally the case with political leaders in Cuba, little is known publicly about Díaz-Canel's personal life. Few who know him are willing to talk about him and the government does not release personal information about politicians. Several people who knew Díaz-Canel during his time in Santa Clara spoke to NBC News and shared their memories of the man they call Miguelito, or Migue, whom they described as down-to-earth and accessible. Guillermo Fariñas, one of Cuba’s most prominent dissidents, was friends with Díaz-Canel during their pre-teen years in the 1970s. They played basketball, and despite the racial discrimination that existed at the time, Fariñas, who is black, said Díaz-Canel didn't show any prejudice. Fariñas described Díaz-Canel as "curious, impulsive, aggressive, brave and reckless, and a 'amigo de sus amigos,'" a true friend. As a high school and college student, Díaz-Canel “was friendly, tall, with long, blondish hair,” said Santiago Alpizar, a Miami attorney who ran in the same social circles. He remembers him at parties where young people listened to American music, even though it was frowned upon by the government at the time. Díaz-Canel was “jovial” and avoided conflict or talk about politics, Alpizar said. As a teen and young adult, “he was not the person he appears to be today,” Alpizar said. Díaz-Canel obtained an electrical engineering degree in 1982, fulfilled his military service and served on a mission to Nicaragua, which had a leftist government at the time that was a strong ally of Cuba. Fariñas said their relationship changed over time after he and other psychology students were almost kicked out of school in 1983 for taking an interest in the work of Sigmund Freud. According to Fariñas, the communist government allowed them to study only the work of the “rusos” (Russians). “Díaz-Canel was no longer the nice friend I knew and advocated for our expulsion,” Fariñas said. Yet Fariñas said his most recent experience with Díaz-Canel was unusual for a Communist Party official and a dissident. Fariñas was recovering from a hunger strike at a hospital that had sustained an electrical explosion, and Díaz-Canel went to visit the patients. Fariñas was surprised when Díaz-Canel not only came to his hospital room but later asked doctors what he needed for his recovery. When they recommended evaporated milk, he made it happen, Fariñas remembers. Ramón Silverio, who has known Díaz-Canel for decades, described him as "advanced in his thinking." In 1984, Silverio had created a place in Santa Clara called El Mejunje ("hodgepodge"), to provide a safe space for LGBT people, as well as artists, bohemians and rockers. This was a bold move since Cuba was transitioning from the 1960s and ’70s when such groups were the targets of repression and imprisonment. Silverio recalled that Díaz-Canel was one of the political leaders who helped keep the space open, even taking his two young children to the kid-themed events held on Sundays. “He was one of those people who went to the theater because he loved it, not because he had to comply with a political task,” said Silverio. Agent of change, or of the status quo? Leiva, the dissident and former senior Cuban diplomat, said there may not be much change if Díaz-Canel becomes president. She points to the fact that Raúl Castro will remain chief of the Communist Party of Cuba, the most powerful political position in the country and one that, since 1976, the Castros have held along with their presidencies (Fidel died in 2016). 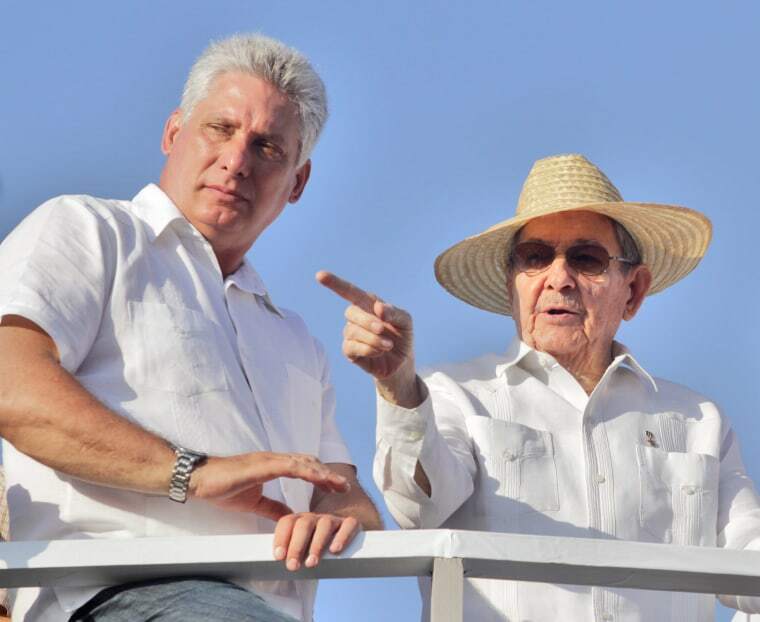 “Raúl Castro, with the militares, (military) will maintain power,” keeping Díaz-Canel and others in check, Leiva said. Díaz-Canel does not have the clout the Castro brothers held as figures of the revolution and, as a result, he will be judged more by the nation's economic performance, according to Lopez-Levy, the University of Texas professor. “If he is not able to improve the economic situation, he will have to deal with the political repercussions,” he said. A change in Cuba’s leadership could affect its relationship with the U.S., one that has become increasingly fractious since Trump took over. Cuba’s economy would benefit tremendously if the U.S. Congress finally lifts the almost six-decade U.S. embargo, said Gustavo Arnavat, a senior adviser at the Center for Strategic and International Studies and a former Obama administration official. The reward, he said, would help Cuba reach its goals of saving the achievements of the revolution, particularly in the areas of health and education, while improving its economic future. But he thinks that’s not going to happen until the Cuban government offers something meaningful to the U.S. — especially to a president who prides himself on doing good deals. “The trick is finding what that is,” Arnavat said. Carmen Sesin reported from Miami, and Orlando Matos from Havana.